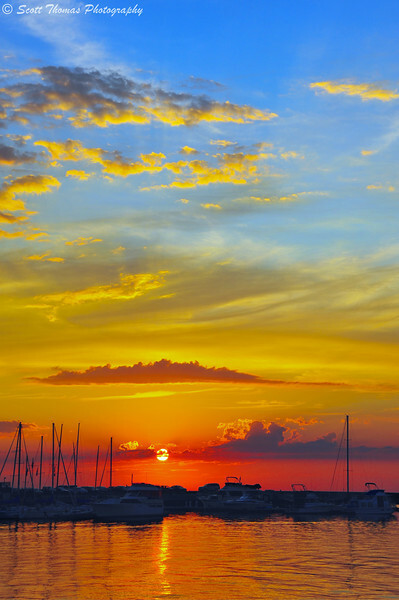 Sunset over the Oswego harbor on Lake Ontario. Nikon D700/28-300VR, 1/400s, f/10, ISO 200, EV +0.3, 78mm focal length. Took an expected drive up to Oswego, New York for dinner and stayed for the sunset. Can you blame me? This entry was posted in Nature and tagged 28-300mm, clouds, harbor, Lake Ontario, new york, nikon D700, oswego, sky, sunset, vr, water. Bookmark the permalink. oh gorgeous. Can you send some sun over to me? Haven’t seen it in days! What a beautiful shot. Would love to, Simone! We’ve had a pretty dry summer this year. Not as bad as some places in the US. We’ve had a some rainy days over the last couple of weeks which has been needed. I love the color gradient from very blue through yellow and orange all the way to red. It was pretty cloudy when I left for Oswego last night. The thick clouds moved off to the east and left these lovely ones behind. Ooooo nice! The colors are gorgeous! Scott, it’s gorgeous, love the colors. What is a vivid setting in canon, is that the Color Space of sRGB or Adobe RGB I wonder? WOW – spectacular and amazing colors! Thanks, Truels. Going to be hanging this one on the wall soon. What a gorgeous shot! You caught that one just right! I sure did…I had to wait and keep testing until the full spectrum of color you see here appeared. It was gone a couple of minutes later. Beautiful colors! Sunsets like this are rare for us to see here on the east coast. There is one spot Norht of me where it can be done. You are lucky! I do know how lucky I am to have Lake Ontario so close to me for sunsets and recreation. While finding a good location for a sunrise is much more difficult for me. Gorgeous. I noticed you said in reply to another comment that you will be framing this one. May I ask who you use for prints? I use Sumgmug.com printing service through Bayphoto.com. I think they are better than Mpix.com. Another quality printing service many pros support. Stunning. The colors in this are just amazing. It really is a beauty. I like the mental image, too, of you lying in wait to capture the best moment of the show! You can never have too many sunsets.